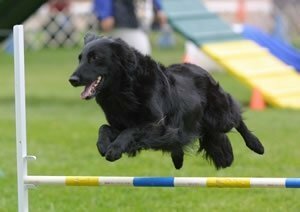 This guide provides handlers with information about the Flat-Coated Retriever Society of America’s (FCRSA) Working Certificate and Working Certificate Excellent tests. You’ll find advice for preparing yourself and your dog for the tests, a step-by-step walk-through of each test, answers to questions frequently asked by handlers, and a brief glossary of terms. Our hope is that this guide will help prepare you and your dog for success. Please view guidelines in pdf format. Flat-Coats are slow maturing dogs but even in the "mature" Flat-Coat there usually remains a spark of joy & mischief! The Flat-Coat is a thinking dog. One of the leading authorities on the breed, Dr. Nancy Laughton of Great Britain, refers to the Flat-Coat as a canine Peter Pan. Download Event Insurance, Certificate Application & Application to Host a Sponsored Test. A wonderful article on field training by Doris Ehret...Read Now!